I know I have been posting nothing but salads recently, but that is all I seem to want to eat. Nice crisp, cold salads. This one is no exception. You wouldn't think it, but the combination of tomatoes and watermelon together is pretty amazing. Sweet, tangy perfection. One of these days I will start posting other recipes like pies and hearty fall food, but until then I am getting my fill on fruits and vegetables because this tomato watermelon salad is what I am going to be dreaming about come cold, dreary January. To me, this is one of those perfect salads. A salad that doesn't taste like you are eating something healthy. The sweet watermelon, the tangy red onion combined with nutty pistachios, salty feta and of course the juicy tomatoes - it is a salad for all of your senses. It is beautiful to look at and even more beautiful to eat. The invention of seedless watermelon has changed the game when it comes to watermelon in my option. It makes it perfect for putting in a salad or adding it to every day foods. It is also really healthy - I love juicing it and drinking it as an aqua fresco or even putting it in my margaritas!! I topped the salad with some mint, olive oil, white balsamic vinegar and of course salt. The vibrant colors alone makes me happy to eat this tomato watermelon salad but it tastes pretty darn incredible too. 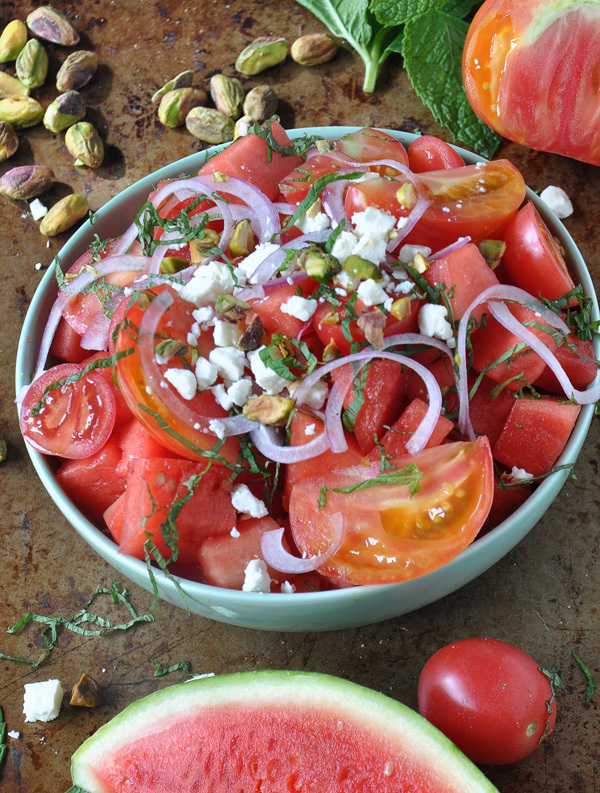 In a bowl, combine watermelon, tomatoes, red onion, feta and pistachios. Drizzle with olive oil, vinegar and salt and pepper. Top with mint.